Programmable web has a timely post on what MapQuest has been doing. Most recently the mapping pioneer released a geocoding web service and static maps. In fact, many recent posts on its developer blog have included multiple announcements, testament to how much the company has been releasing. Some cool new stuff for sure. 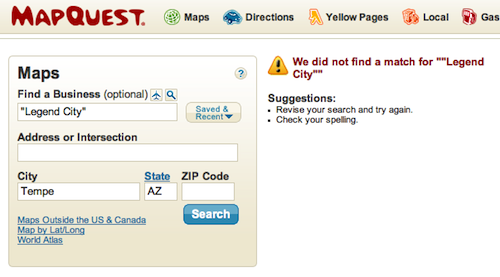 My only issue is that I can’t find Legend City using its geocoder. No Legend City in these parts….